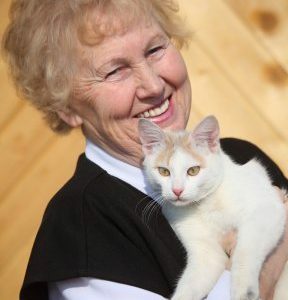 Researchers are going to start examining the benefits of pet ownership on mental and emotional health in older adults living alone by matching research participants with homeless foster cats. Funded by a two-year grant from the Human-Animal Bond Research Institute (HABRI), faculty from the University of Georgia’s College of Public Health, College of Veterinary Medicine, College of Family and Consumer Science and the Obesity Initiative will come together to collaborate on this project. With the participation of the Athens Area Humane Society and the University of Georgia’s Campus Cats organization — a rescue group that helps homeless cats on campus — the team started matching foster parents and felines last October. The 34 pairs of cats and seniors will be assessed throughout the study to determine whether having a pet in the home leads to changes in quality of life. Assessments include loneliness, emotional well-being and purpose of life scales, as well as attachment to, and comfort from, the foster cats. The team is led by Heidi Ewen, PhD, and Sherry Sanderson, DVM, a professor at the College of Veterinary Medicine. Researchers hope to find improvements in mental and behavioral health, including reduction in loneliness and depression, and that an attachment to the cat will increase the duration of fostering or lead to actual adoption. The majority of people who live alone are 75 years or older, and many of them tend to spend their days inside the home. For those who are single, it can be hard for them to maintain social connections. Furthermore, living alone can cause struggles for an individual to plan meals or engage in other daily activities without another person around to share them.